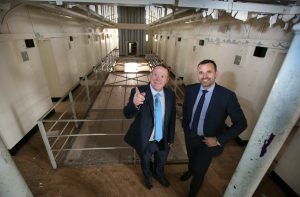 A formal legal agreement has been sealed to enable the exciting redevelopment of Northallerton’s former prison. Hambleton District Council and Hull-based regeneration company Wykeland Group have formed the Central Northallerton Development Company, a joint venture vehicle to drive forward the North Yorkshire town’s most significant regeneration scheme for decades. The new company aims to deliver a wide-ranging regeneration of the 3.5 acre site. Proposals for the disused site include retail units, managed workspaces, a heritage centre, apartments, restaurants, a cinema and an area for public events. 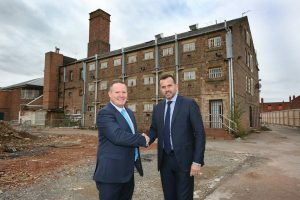 Wykeland Managing Director Dominic Gibbons said: “With the formal structures for the development company in place we can now move forward together to deliver this very exciting scheme. “We’re really looking forward to working closely with the local authority’s members and officers to bring an important part of Northallerton’s heritage back to life and deliver significant economic and community benefits to the town and its people. In preparation for the mixed-use development, a number of buildings have been demolished and extensive archaeological works have been carried out, during which foundations for the world’s largest treadmill were unearthed. Five listed buildings have been retained, including the former female prison wing and the Governor’s House. These buildings will be sympathetically refurbished and incorporated into the phased development of the site. Northallerton Prison dates back to 1780 and housed prisoners for more than 230 years before closing in 2013. Hambleton District Council bought the site from the Ministry of Justice in 2014 to secure a key strategic site close to the town centre for development. The legal agreement follows a decision by the council to select Wykeland as its development partner following a competitive tendering exercise. Wykeland Group is a leading developer in Yorkshire and the Humber, with a £300m development pipeline within the region. The company is a long-standing and trusted regeneration partner of the public and private sectors, having the region’s long-term economic growth at the core of its business. Wykeland’s flagship projects include the fast-growing Bridgehead business park close to the Humber Bridge; the @TheDock development in Hull’s Fruit Market, which includes the Centre for Digital Innovation (C4DI) tech hub; the Flemingate mixed-use regeneration scheme in Beverley, East Yorkshire; the Meltonwest business park, west of Hull; and G@Glasshoughton, which comprises four development sites off the M62 in West Yorkshire. 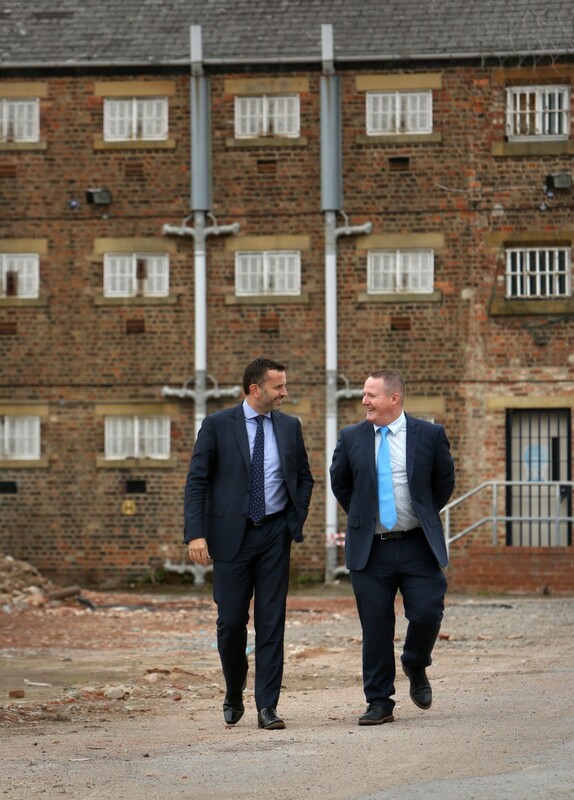 Wykeland is also working in a joint venture with Beal Homes to deliver the £80m regeneration of the Fruit Market area of Hull, in partnership with Hull City Council. DWF acted for Wykeland on the legal agreement and Trowers Hamlin advised Hambleton District Council. Hambleton District Council Chief Executive Justin Ives, left, and Wykeland Group Managing Director Dominic Gibbons shake hands on their partnership for the redevelopment of Northallerton Prison. 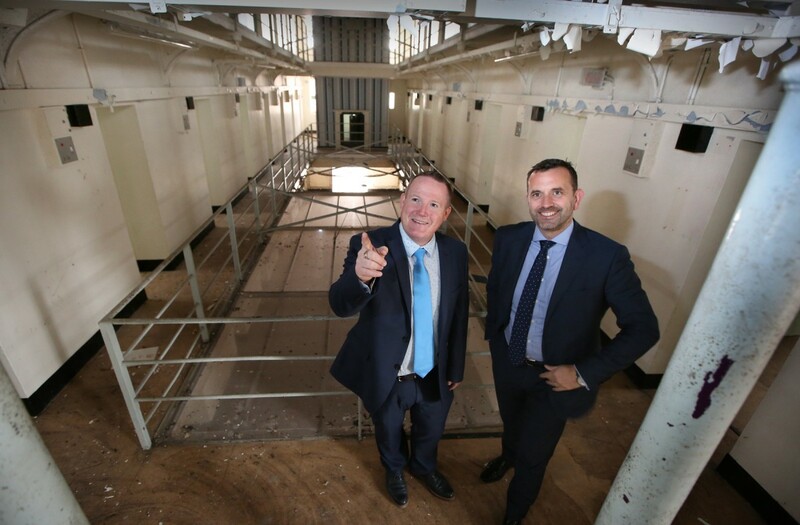 Hambleton District Council Chief Executive Justin Ives, left, and Wykeland Group Managing Director Dominic Gibbons inside a cell block which will be incorporated within the redevelopment of the former Northallerton Prison site. 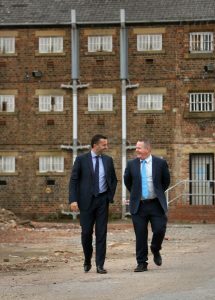 Wykeland Managing Director Dominic Gibbons, left, tours the disused Northallerton Prison site with Hambleton District Council Chief Executive Justin Ives. The redevelopment of the site will be the town’s most significant regeneration project in decades.